This book examines Western foreign policy towards the Middle East, and the extent to which the promotion of democracy has been in conflict with, or supported by, other goals (geo-strategic, economic, and cultural) in the policies of the major actors towards the Middle East. Does the Arab Spring provide a new opening for cooperation with the region? Contributions are offered by scholars with research interests in Middle Eastern politics, and by those analysing the policies and interests of external actors. Against the backdrop of the recent ‘War on Terror’, the comparative and interdisciplinary outlook of the book will offer the opportunity for much needed intellectual exchanges between political scientists, contemporary historians, and international relations scholars from Europe, North America and the Middle East. 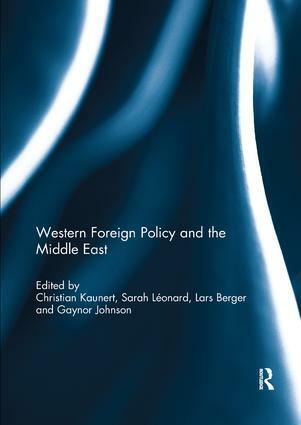 Since it coincides with and/or follows the final phases of US and British withdrawal from Iraq and Afghanistan, this book will be highly relevant to both academics and policy-makers in the UK and abroad, making a significant contribution not only to the scholarly investigation of Western foreign policies, but also to the study of the Middle East in general. This book was originally published as a special issue of the Cambridge Review of International Affairs.